I discussed buildings and roads as tourist attractions before, here. 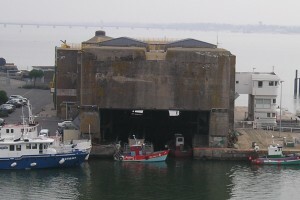 But traveling through France some years ago, I came across the ugly U-boat base in Saint Nazaire, which is an unlikely tourist attraction but one I was fascinated by. I was shocked by the vast size of this building. 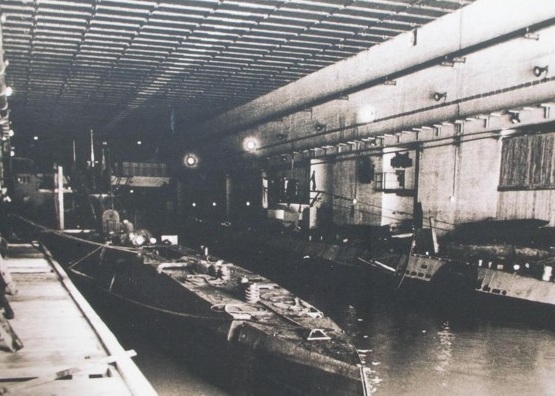 These U-boat bases were built during the Second World War to protect submarines while they were being serviced and prepared for their next trip. 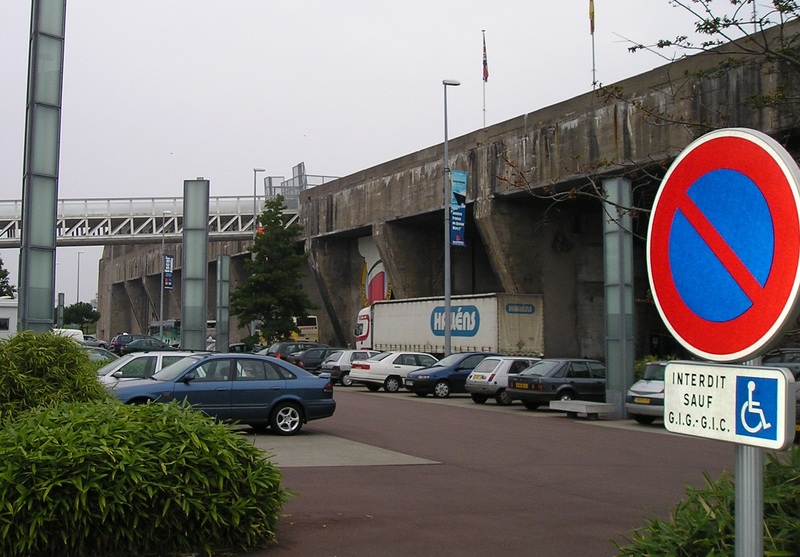 This huge structure in Saint Nazaire is only one of the many located throughout Europe. The majority are located in France where there are five in total. These are located in Brest, Lorient, Saint Nazaire, La Rochelle and Bordeaux. Others are located in Norway, Germany and I think Italy. The U-boat base in Saint Nazaire is an enormous reinforced concrete structure. It was constructed between January 1940 and December 1941 by the Todt organisation. 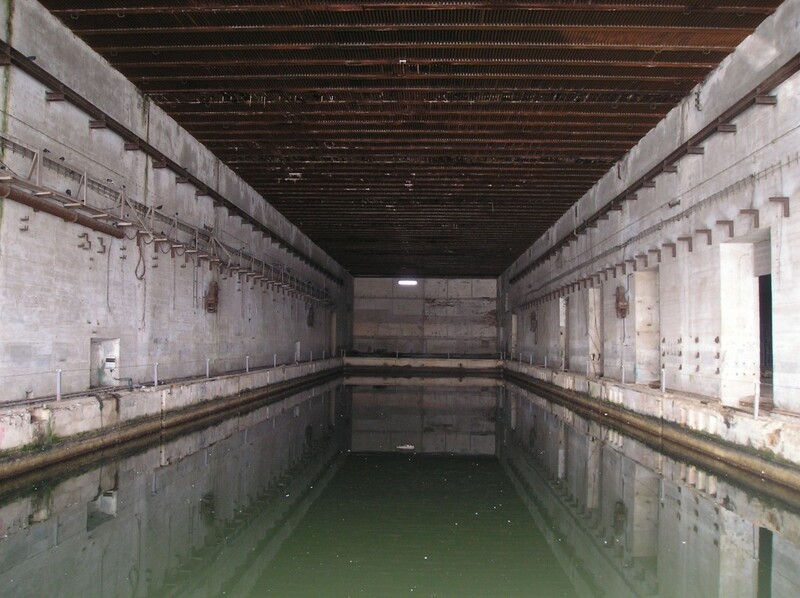 The structure housed two flotillas of submarines and contained 14 cells, each cell allowed two submarines to dock. Five of the cells were also dry docks where the water could be drained out to inspect and repair the underside of the boats. In total the building used 500,000 m3 of concrete, with foundations 12m deep, walls 3.5m wide and a roof slab 4m thick. 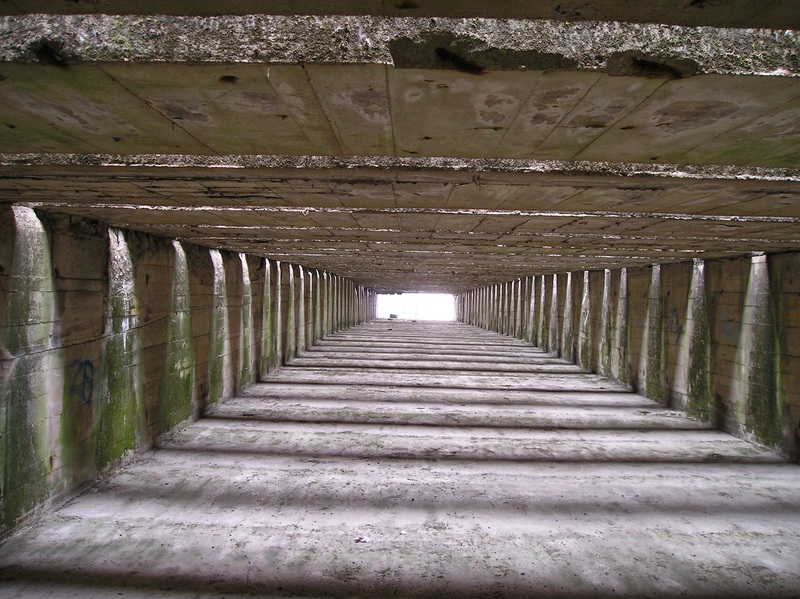 The roof slab was later strengthened with external cross beams to resist the larger bombs the allies began to use i.e. the ‘Tall Boy’ and ‘Grand Slam’ bombs which weighted 6 tons and 10 tons respectively. In total the building measures 300m long X 130m wide X 18m high. 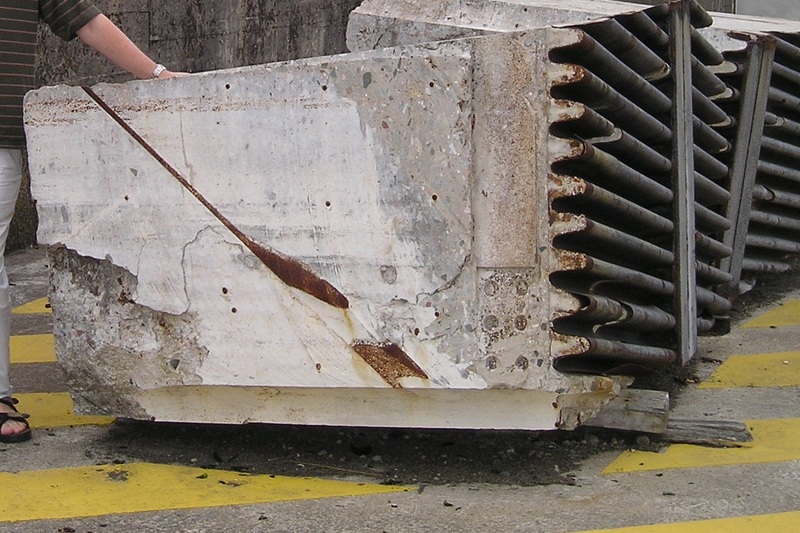 In 1943 a separate concrete bunker was constructed around the habour lock to protect the U-boats while they used the lock to enter and leave the harbor. To give an idea of the scale of the building it also included the following: 62 Workshops for torpedoes, engines, welding steel, periscope repairs etc, 97 warehouses for spare parts, 150 offices for supplies, 92 dormitories and rooms for crew along with kitchens, bakeries, hospitals, toilets, shower rooms etc. The building was a town in itself. 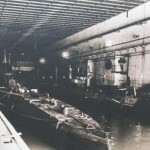 The bunker protected the u-boats from allied bombing raids throughout the war and despite 50 separate bombing attacks the Allies were unable to damage it. Instead they resorted to destroying the town surrounding the base by high altitude bombing raids and as a result the town was evacuated on the 1st of March 1943 to prevent further civilian deaths. The base and town were defended by 28,000 German troops and these surrendered at the very end of the war, on the 10th May 1945. The Allies having decided to leave this pocket of resistance alone as the U-boat threat had been defeated at sea. A view of St Nazaire in 1945, destroyed by air raids, while the intact U-Boat base remains. After the war, plans were made to destroy the bunker but these were rejected after the costs were calculated, which were estimated at 500 million francs in 1940’s money. Instead part of the post war French submarine fleet was based at the bunker for a time. Now part of the building is used to house a submarine museum, another section houses a tourist information office, while the remainder (the vast majority) is left for tourists to walk around. What amazed me walking around was why the Allies allowed such enormous structures to be built in the first place. With a two year build time, it would have been better to bomb these during construction not afterwards when they were nearly impenetrable. It’s worth a visit if you are in the area during the holidays, although I couldn’t really recommend the town of Saint Nazaire, as it is very bleak. The next town down the coast La Baule is well worth a visit also, it has a long sandy beach in the center of the town and great restaurants. There is a tourist information office located in the U-boat base and tours can be booked there for the submarine museum, the nearby Airbus factory and the adjacent Chantiers de l’Atlantique shipyard, now owned by Aker Yards. The Airbus factory requires English speaking tours to be booked well in advance and instead at the time I took a tour of the shipyard which is one of the largest shipyards in the world. At the time I visited they were building three huge cruise liners each worth €800 million, it was very interesting especially the enormous 900m long dry dock where the cruise liners were being constructed. Some famous ships recently constructed there were the ‘Freedom of the Seas’ and the ‘Queen Mary 2’. I will be visiting France and Loire Valley this Summer. Is there a German U Boat display (real U boat), inside the museum at the St. Nazaire U Boat pens. As far as I am aware no. The submarine in the museum is an old French submarine . I didn’t go in as i was in a submarine before and just found them to be really cramped . Once is enough. The men doing the raids were very brave alright. The old British films might be accurate enough, afterall ‘a night to remember’ seems to have been far more accurate than the other recent Titanic films. I have read the book “The Greatest Raid of All” by C. E. Lucas Phillips. It covers in great detail the raid in late March of 1942. “its object was to destroy the essential gear of the largest dock in the world, so that it could not be used by German battleships, and it was brilliantly successful in its main purpose.” This is from the back cover. The book covers the people and the action in detail. If you have just been there, read it, if you are going soon read it . It will add a lot to the visit. I will be visiting northern France this coming summer. I do hope we have time see this area. Thanks for that info. I will check that book out. 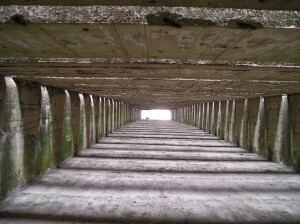 I am totally fascinated by WWII topics in general and these submarine pens in particular. I want to travel to France to visit some of these sites along of course, the beaches at Normandy. How easy is it for English speaking only tourists to get around these towns and sites? Its easy enough for English only speaking tourists in France. I don’t speak French and have been over there many times with no problems. There are English speaking tours of the Normandy beaches as well. I was stationed at St. Nazaire back in 1958, was there about 15 months. La Baul was beautiful, particularly the horse shoe shaped beach! Some great memories! !